Babaria Snake Venom Syn-ake Anti wrinkle Cream 50ml | Mia Beauty Ltd.
Signs of ageing disappear under your fingertips with Babaria’s SYN-AKE Anti Wrinkle face cream. 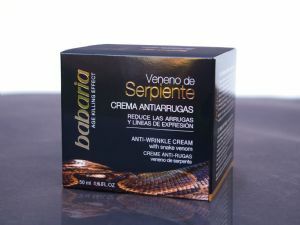 This amazing cream is based on a synthetic peptide that mimics the activity of the peptide found in the venom of the Temple Viper (Tropidolaemus Waglerrin) found in Malaysia. SYN-AKE is proven to help smooth and prevent wrinkles by inhibiting muscle contractions, a fact many celebrities are taking advantage of. This luxurious cream with its silky texture, has been enriched with 4% SYN-AKE and Shea Butter as active ingredients, smoothing out fine lines and wrinkles whilst delivering intense moisture and leaving your skin irresistibly smooth. 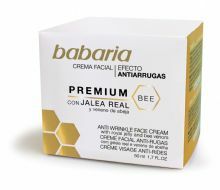 As soon as the cream is absorbed into the skin its effects are shown as up to 36% reduction of wrinkles increasing by up to 82% after two hours when it is working at its maximum effect. The effects reduce over time but it has been shown to continue working for up to four days. Clinical trials conducted with a 4% SYN-AKE using 45 volunteers for 28 days, applying the product 2 times a day, have shown that it. Reduces forehead wrinkles by up to 52%. Reduces wrinkles by up to 82% for muscle contraction. Apply morning and night to the face and neck, massaging in gently until the cream has been completely absorbed. •Reduces wrinkles by inhibiting muscle contractions. •Leaves skin feeling very soft and smooth.